I have to say, my skin now at 34 is probably (touch wood) acting the best it ever has. Yes I have the odd small acne scar and I hate the bags under my eyes and my pores but it's relatively trouble free in terms of spots now I have nailed what skincare products are 'good' for my skin. Also, my skin has been super forgiving whilst I have been recovering from my cancer surgery. Whilst in hospital and for a good few days over the past few weeks I have relied on micellair water especially as I haven't been wearing much makeup if any at all (still can't stoop to wipes) and it's still looked ok.
Ali was desperate to be in these photos and managed to sneak his paws in! But if you don't love Ali we can't be friends. First up-cleanser. I do just one cleanse in the morning, in the shower with this easy to wash off cleanser from Algenist. The Gentle Rejuvenating Cleanser contains Alguronic Acid which is a naturally sourced micro algae and antiaging powerhouse. Unlike most cleansers I use, I apply this to damp skin otherwise it seems to 'stick' to the skin making it harder to remove. It's very gentle on the skin, is non drying and contains no nasties such as mineral oil, parabens or sulfates. I bought mine from Space NK for about £18. I probably wouldn't repurchase although I don't have anything bad to say, it's just a functional cleanser than does the job. I use a hydrating toner in the morning and could rave til the cows come home about the Origins Make a Difference Plus rejuvenating treatment lotion. I usually like my hydrating toner in spray form but this is definitely a 'lotion' making it unsuitable for spraying. It smells amazing-probably from the watermelon and lychee extracts-and you apply it by sweeping it over your skin with a cotton pad. When you first apply it to the skin it feels cooling and refreshing but also quite 'wet'. But it dries in under 30 seconds and leaves your skin primed and plumped ready for the next stage in your skin care routine. This sounds weird but I almost feel like this lotion acts like a magnet to hold your next product in your skin. Personally I love it and will definitely repurchase! Brilliant for drier and combination skin-I will be recommending this range to all my drier skinned friends. Unfortunately you can't get Origins in Dubai and I picked mine up at Heathrow duty free. Next up-eye cream. I have gone back to the Clarins Eye Revive Beauty Flash as my morning eye cream. It's very light, hydrating and the perfect pick me up in the morning. It also doesn't irritate my under eyes (many eye creams do). It needs to be quite well massaged in though otherwise it tends to gather in under eye creases. The Trish McEvoy Beauty Booster Serum is probably the product I don't need in my morning routine. I bought this when I was in NYC and I got the proper hard sell from the SA on the Trish McEvoy counter in Bloomingdales. Here's the deal-this is pretty much, to my understanding, Hydraluron in liquid form (and a much much more expensive version). I was told this would be great for my skin because a) I travel a lot b) I need to think about anti-aging. So, this and hydraluron contain a pure form of hyaluronic acid which is an incredibly hydrating ingredient that holds up to 1000 times it's weight in water. What this means is better hydrated, nourished and plumped up looking skin. So I bought it. For $128. Plus tax. And honestly, it feels like I am applying water to my skin. Which I probably am as the main ingredient is dah dah dah-water. Hyaluronic acid appears 12th out of 14 on the list of ingredients. But I'm just not impressed with it and haven't seen any significant benefit to using it. Trish McEvoy state it can be used over make up to refresh your face but personally I wouldn't. Despite my pretty negative review there are some real rave reviews of this product on the Nordstrom website. Perhaps it's more suitable for slightly older ladies but I do like the idea of prevention rather than cure!! After my application of serum (water) I then go in with my personal holy grail moisturiser. This is my third tube of the Caudalie Vinosource Moisturizing Sorbet which is, in all honestly a very basic moisturiser that makes no outlandish claims but my skin loves it. Whenever my skin is breaking out with a new moisturiser I always come back to this as it calms and soothes and restores my skin back to normal. I don't have sensitive skin (although I can see why it would be perfect for those with sensitive skin) but this 'sorbet' is super light and provides the perfect amount of hydration to my combination skin. 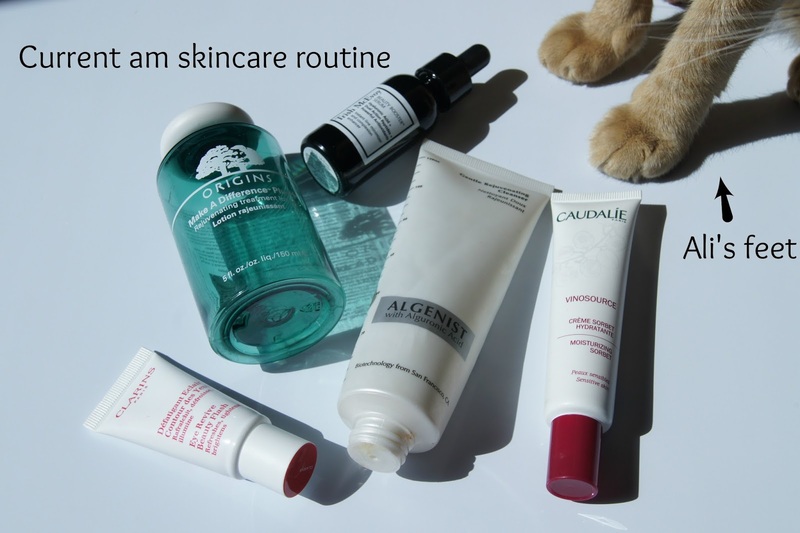 So that's it, 5 products that have kept my skin calm and happy recently-3 I will definitely repurchase (Caudalie, Clarins and Origins) and two it was good to try but won't re-buy. What's your morning skincare routine?